ISLAMABAD (May 22, 2015): Speakers here on Friday called for commitment and action to halt loss of biodiversity as our survival hinges on its protection and sustainability. They were addressing inaugural ceremony of an event organized to celebrate International Day for Biological Diversity at Pakistan Museum of Natural History (PMNH). Prof. Dr. Muhammad Ashraf, Chairman, Pakistan Science Foundation (PSF) was the Chief Guest. The Speakers included eminent scientists like Prof. Dr. Qasim Jan, Advisor COMSTECH, Dr. Z.B. Mirza, a zoologist and wildlife specialist, Mr. Saeed-uz-Zaman, Consultant Biodiversity and Dr. M.K. Leghari, DG, PMNH. A large number of students and teachers from educational institutions of twin cities, scientists, environmentalists and people from different walks of life attended the event. The speakers said that awareness about the biodiversity loss is now insufficient and immediate steps are needed to mitigate loss of biodiversity otherwise it will be too late and our own survival will be at risk. 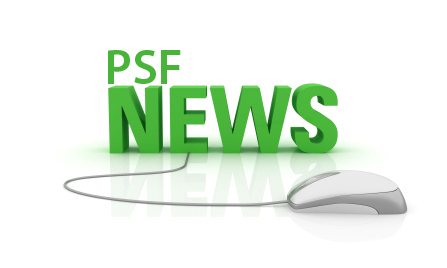 The PSF Chairman said agenda of different national and international summits on Biodiversity is the same focusing same problems like clean water scarcity, climate change, biodiversity loss and food security etc. He said that instead of creating awareness about these issues now it is the time to take practical measures for halting and reversing the loss of biological diversity. Dr. Ashraf said that every living thing is part and parcel of this universe and its existence is not without any purpose as every living thing depends upon others for food and shelter and can’t survive in isolation. He said that elimination of a single creature jeopardizes the survival of many other living things. The Chairman PSF said that all the above-mentioned issues are interlinked and we should use the appropriate methodology to address them. He was of the view that students are saviors of our future and they should take actions like plantation to protect biodiversity. He also emphasized the need for actions to achieve sustainability of our natural resources. He also stressed that the invasive species of plants that are heavily consuming underground water should be eliminated from those areas which are short of water in order to maintain natural balance of ecology. 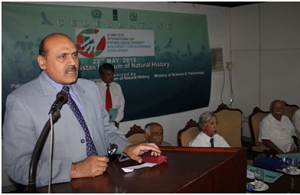 Dr. Qasim Jan said that certain species are eliminating very rapidly due to geological changes ignited by man himself. He said that climate of our planet Earth has gone up by one degree and at two degree the temperature will reach at the level of very hot while at four degree there will be disaster. He said that per capita water has reduced five times and we have to conserve water by reducing its use as there is a fixed budget of water on this planet. Dr. Z.B. Mirza, Mr. Saeed-uz-Zaman, Dr. M.K. Leghari and Dr. Muhammad Rafique also spoke on the occasion and they highlighted various threats to biodiversity and required steps to thwart them. The Chief Guest also awarded certificates to the winners of a poster competition organized by PMNH on Biodiversity Day.